How are you doing i hope all is well with you, I will really like to have a good relationship with you and I have a special reason why I decided to contact you because of the urgency of my situation here. I am writing this mail to you with heavy tears In my eyes and great sorrow in my heart, My name is Miss. Alisha kablan, am 20 years old girl in West Africa,5.8ft tall, fair in complexion, from Zimbabwe, the only daughter of Late Dr. Daluwa Kablan who was killed by his Business partner. I need to tell you more things, but first I need your help to Stand for me as a trustee. My father Dr. Daluwa Kablan was importer and exporter of many types of business. My father was killed by his Business partner. father Business partner sent assassins to kill all the members of my family because my father was progressing more than them. The assassins came around 1: am in the night they killed my father my mother and my two younger brothers, am the only survive in my family because i was not in the house when the criminals came i was in the school hostel. Am the only survive of my family so i managed to make my way to the nearby country Senegal, where am now residing in a refugee camp in Dakar Senegal for the sake of my life. I am constrained to contact you because of the maltreatment I am receiving from my step mother and uncle since i loss my parents. They planned to take away all my late father' s treasury and properties from me since the unexpected death of my beloved parents. There aim was to kill me too so that they will take everything my father left. Meanwhile I wanted to escape to Europe but my step mother hideaway my international passport and other valuable traveling documents. Luckily she did not discover where I kept my Father' s File which contains important documents. So I decided to run to the refugee camp in Dakar Senegal where I am presently seeking asylum under the United Nations High Commission for the Refugee here in Dakar, Republic of Senegal. I wish to contact you personally for a long term business relationship and investment assistance in your country. My father of blessed memory deposited the sum of US$ 5.500, 000.00 us dollars in Finance Firm with my name as the next of kin when he was alive. I want you to help me to transfer this money from the bank my late father deposited it to your account in your country so that i will join you and invest the money over there. I contact you because I need a foreign business partner who will help me in this transaction. I can only get foreign business partner through computer that is the reason why i contacted you. However I shall forward you the necessary information of the deposit on confirmation of your acceptance to assist me for the transfer and investment of the fund in your country. As you will help me in an investment and I will like to complete my studies in your country after the transfer, as I was in my school before i escaped to this country Senegal to safe my life. I want you to help me to transfer the money from the bank my late father deposited the money to your account in your country all i need is your honesty and trustworthiness. It is my intention to compensate you with 20% of the total money for your services and the balance shall be my investment capital. This is the reason why I decided to contact you. Please all communications should be through this email address only for confidential purposes. There are millions of people in this country, who will help me if I tell them this matter, but i don' t want to stay in this country and i don' t want to invest anything in this country. As soon as I receive your positive response showing your interest I will put things into action immediately. Please do keep this only to yourself please I beg you not to disclose it to anybody till I come over to you in your country once the fund has been transferred. I hope my explanation is very clear but if you need further clarification, then send in your questions. Thanks as i hope to receive from you soon. Subject: I WILL BE GRATEFUL TO BE HAVE A FAMILY WITH YOU!! I know it is skeptical for you to receive such mail from someone you haven' t met or been with before in life but I must say that after going through your contact I made up my mind to contact you because I know that after you hear my story that you will not have the mind to betray me or sit on this fund after the successful transfer. I appreciate your concern and your willingness so far, i really need your assistance, the most important thing i need from you right now is your honesty and trustworthiness, I choose you in this transaction based on my present status here in Dakar as a refugee under asylum, According to the financial governing laws of this country, people under refugees are not allowed to participate into monetary transaction or operate personal bank account with large sums international or locally. I have made contact with the bank in Scotland United Kingdom several times through their email address and they confirmed the existence of the fund to me and have promised to transfer the money to any foreign account that I mighty furnish them with because the fund was deposited for onward transfer into his partner' s account oversea before his sudden death and after his burial there is no way I can connect to any of his business partner oversea and that is the reason why I have contacted you because I don' t want to contact his partners in Zimbabwe my home country they will sit on the fund too as I do not trust them together with what happened to my late parents i don' t know whom to trust among them. I want you to understand more about my situation here in the camp, I am e-mailing you from the office of the Rev. Father who is Priest at the church in the refugee camp, I have explained to him a little about my life though not everything, i told the Rev. Father about my communication with you and he permitted me to access my e-mail in his office computer here in the camp, meanwhile life has not been easy since I don' t have anybody here to take care of me. I don' t have access to further my education No access to clean water, no access to good food here in the refugee camp, life has not been easy for me. I am only surviving through the aid of the Rev. Father Steve Dominic, he permitted me to be receiving phone calls from you through his office telephone number; which is as follows:( +221 778 106 381) call me with this his number when you call Rev father tell him that you want to speak with Miss. Alisha kablan,,, the Zimbabwe girl in the camp he will send for me to come and answer to your call OK. I will furnish you with all the vital documents covering the deposited fund under the holding bank, only if you can promise me that you are not going to betray me or sit on my inheritance after the money transfer to your account in your country, please tell me more about yourself again in your next mail. Please understand that there is no illegality involvement in this transaction, you are going to deal with the holding bank directly. I am with important documents here. Deposit certificate of the money and death certificate of my late father. All I need from you now is your sincerity, honest and seriousness about this transaction. Try to send mail to me every day so that we will do this transaction without wasting any time. Your city name. . . . . . . .
and all that you will want me to know about you,I need all your information So that I can submit them to the bank to enable me to send mail about you for them to know that you are the one who will access to my late father' s deposited funds and then apply for it' s claim and transfer directly on my behalf to your account. May God bless you and your family, i will send you the bank contact in my next mail so that you will contact the bank for the transfer. God will bless and reward you for every effort you are about to take to see that I am out from this horrible prison called refugee camp where i am living today as a result of the untimely death of my late parents (may their gentle souls rest in peace) I really want your help please,,, Thank you so much i am really happy having you by my side i really want to come out of this place and join you over there to start up a new life with you and members of your families under your care and advise, i believe with you everything will be OK with me thank you so much. Please all i want you to do is to write a letter to the bank and let them know that you are my partner that wants to help me in the transfer because the bank ask me to look for a trustee who will stand for me since i am in refugee camp that was the reason why i want you to help me. This is the bank contact i send it to you now so that you will contact the bank for the transfer. try to contact the bank for the transfer Immediately. I have also written to the bank manager and let him know that my partner will reach them he knows little detail about you. Try to contact them immediately for the transfer. After the successful transfer in to your account you will arrange and send me some money here to get my traveling documents to join you over there in your country. I want you to send an application letter to the bank email and ask them to transfer the fund in my late father account to your account,I have officially sent a nomination letter to the bank introducing you to them as my partner. 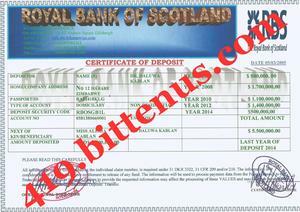 Here is the contact information of the bank in Scotland, United Kingdom where the money was deposited by my late father with my name as next of kin. Send application letter to their email address for the transfer. THIS IS THE BANK CONTACT INFORMATION. Royal Bank of Scotland9-13, Paternoster Row, London, EC4M 7EJ. Let them know that you are my partner for the transfer of the fund in the account details I have informed you here in try and contact them so that you can hear from them. I have written to them about you so send them application letter for the transfer now. All I need from you now is your sincerity, honest and seriousness about this transaction. I am waiting to hear from you with the response from the bank about the successful transfer into your private account on my behalf. Thanks, with Love and Respect. I want to be sure of those documents that the Bank needs from us before getting back to you. However thanks for your ability to help me transfer the money to your position pending my arrival to meet with you, it shows you are a dependable and trustworthy helper. Listen, I have never told anybody about this money the only people that knows about it is you and me and the Rev, no one again knows about it (since my parents are dead)so i will also advise you to please keep it to yourself because i am afraid of losing the money to people who will disappoint me when the money gets to their care that was why it took me time to tell you about it and i promise you this from my heart (I AM NOT GOING TO DISAPPOINT YOU) and i equally expect the same from you. Now, regarding the requests the bank needs from us I have with me here the last statement of account (which i will give to the lawyer when he agrees to help us) and the death certificate,(which I will also give him, so he can send the original copies to the bank ) I thought it' s the only thing the bank will need from us but since they need the power of attorney and the affidavit of oath from the high court here in Senegal I have informed the Reverend about it and he gave me the contact of this lawyer below and according to him the lawyer is a registered lawyer in the United Nations Camp here and he is also a registered member in (Senegalese Bar Association) who will help in preparing the power of attorney and affidavit of oath for us in your name. This two documents have to endorsed in your name according to the royal bank. Please I will like you to contact him through email and phone today, when your contacting him, tell him that you are my Foreign partner/trustee and you want him to prepare a power of attorney and also get the affidavit of oath for you from high court here in Dakar Senegal and that he will do it in your names to enable the transfer of my (Late) father' s ACCOUNT in Royal Bank International to the account in your country. So, I will like you to contact him for the preparation of the power of attorney and the affidavit of oath Please try and contact me when you are in contact with him and let me know if he agrees to help us. Please i will like you to first of all get the money transferred and from it you can send some money for me to prepare my documents and meet with you for continuation of my disrupted educational carrier which is the most important thing to me now. I don' t have freedom of my own here that' s what I am fighting to regain.I will be waiting to hear from you soon,with LOVE and RESPECT. How are you doing once again my dear i have scan and attached to you my father deposit certificate please also forward it to the lawyer once you contacted the lawyer and he respond to you please update me okay.